At a news conference organized by self-identified gang members Thursday morning, several speakers complained that police and city officials do not respect them, and that the only way to curb violence is to provide jobs and improving their community. The self-described current and former gang members held a news conference at the Columbus Park Refectory, at 5701 W. Jackson Blvd. on the city's West Side. "You say it's gangs, drugs and guns. We say we need jobs, opportunities and contracts," said Reginald Akeem Berry Sr., who identified himself as a former gang member. "That's the resolution." They are taking issue with Weis' strategy of meeting with gang leaders and warning them of serious consequences if violence continues. Weis held a meeting with the reputed leaders of several West Side gangs at the Garfield Park Conservatory over the weekend. At the meeting, prosecutors warned that the gang members could be charged under the federal racketeering laws if killings were traced back to gangs with members attending the meeting. The Racketeering Influenced and Corrupt Organizations Act, RICO for short, provides stiffer penalties for acts performed as part of a criminal organization such as the Mafia. But at the news conference, the speakers said the city should be working to place young African-American men in jobs, particularly those with criminal records who have paid their debt to society. "The problem with them is that they're giving us an ultimatum - quit - instead of an alternative. But we're offering these young men an alternative, saying, 'Get off the corner selling these bags, and come to this construction site and pick up this brick," Akeem Berry said. Another speaker, Barrion Dupree El, 34, identified himself as a member of the Conservative Vice Lords, and said he has pride in his affiliation. "It wasn't to tear down our community. It was to uplift the fallen stages of humanity," he said. All the speakers said repeatedly that they do not condone the violence in the community and "gang banging" and want to stop it. But they argued that gangs are not the cause of the violence. "You keep saying gang violence. It's drug-related. It's not gang related. It's drug related," Akeem Berry said. Gang members have also taken issue directly with the meeting Weis organized. They say they were tricked into coming to the meeting, and that it amounted to harassment. The Columbus Park news conference was convened by Jim Allen, a self-identified Vice Lords Nation member. Allen is also identified as the "almighty minister" of an organization called Tha Movement. The group's logo features several gang signs in the center surrounded by a circle bearing the message: "Stop the violence. One love." An announcement on the blog for Tha Movement said members of the "Lords, Disciples, Kings, Stones, Hustlers, Souls, Cobras, etc." are expected to be at the news conference. 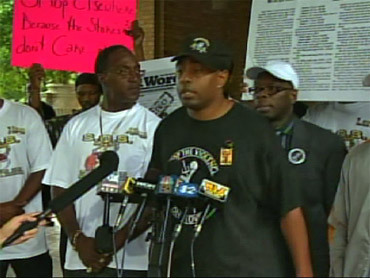 The group is protesting what they call the "unconstitutional, guilty before innocent, premeditated arrest and indictment by Chicago Police hearsay and propaganda tactics," in regard to the threat to use the RICO statute at the "'secret trick meeting' the Chicago Police and others held with whom they deemed to be top gang leaders. "Tha Movement believes this to be nothing more than the continuation of former Chicago Police Commander Jon Burge style tactics of harassment," the announcement says. Burge was convicted this past June of lying about torturing criminal suspects into confessions into the 1970s and 80s. Some Chicago aldermen, as well as police officers posting on the Second City Cop blog, have blasted Weis' meeting with gang leaders as negotiating with "urban terrorists." But Allen told Chicago Sun-Times columnist Mary Mitchell that there was no "negotiation." He told Mitchell that when President Barack Obama was in the U.S. Senate, he said he was "willing to sit down with terrorists without preconditions," but the gang leaders were "tricked" into attending the meeting. The gangs were told they were attending a routine parole hearing when they came to Weis' summit over the weekend. Mayor Richard M. Daley has defended Weis' decision to meet with the gangs. Earlier this week, he said, "If it saves your child's life, you would want me to sit down -- simple as that." On Wednesday, U.S. Attorney Patrick Fitzgerald said Weis was right to meet with gang members to stop violence, but he says neither he nor Weis will negotiate with gangs. "Anyone who thinks that anyone has a pass to commit crime in this city is wrong. The federal government goes after drugs, guns and gangs. If people aren't involved in current violence, we'll still prosecute them for doing drugs. We're offering them nothing," Fitzgerald said. "We are sending them a message that they can understand that the more violent they are, the more of a target they are." Weis says he now plans to have another meeting with South Side gang leaders. Meanwhile, Gang members are also expected to attend another news conference that is being held by local clergy at 11 a.m., at the New Life Christian Ministries of Greater Chicago, 8201 S. Jeffery Blvd. Meanwhile, it was another violent night in Chicago, as one gang-related shooting quickly led to another in retaliation. In the latest incident, a 14-year-old boy was shot around 7:30 p.m. in the 8300 block of South Baltimore Avenue in the South Chicago neighborhood. A gunman approached on foot and shot him in the thigh, said a South Chicago District police sergeant, adding that the boy is an alleged gang member. About 8:43 p.m., a 20-year-old man was shot in the left arm in the 8300 block of South Phillips Avenue when an unknown gunman wearing sunglasses opened fire from a passing vehicle, said the sergeant. The sergeant said the Phillips Avenue attack was allegedly done in retaliation for the earlier shooting of the boy. The boy was taken in good condition to University of Chicago Comer Children's Hospital. The 20-year-old man was taken in good condition to South Shore Hospital, the sergeant said. There were several other shootings overnight for which the motive has not yet been released. One of them was fatal. Johnnie Dyer, 38, of the 400 block of East Oakwood Boulevard, was shot multiple times and killed overnight in the 3000 block of West Fifth Avenue. He was pronounced dead at Mount Sinai Hospital at 12:38 a.m., authorities said. A 20-year-old man was shot in the torso in the 6900 block of South Talman Avenue around 10:55 p.m. The gunman walked up to the victim as he sat on a porch, police said. Around 10:30 a.m., a 15-year-old boy was shot in the foot and shin by two gunmen in the 9700 block of South Lowe Avenue. He was taken to Advocate Christ Medical Center in Oak Lawn in good condition, police said. As of Thursday morning, no one was in custody in connection with any of the shootings. WBBM's Mike Puccinelli, the Associated Press and the Sun-Times Media Wire contributed to this report.